Home » 2013 » Haiku Reflections on Bike JC Event! As we coast on by. Juice drips down our chins. Important sound guy - Makes everyone sound great - Be sure to thank him! 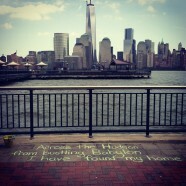 Across the Hudson - from bustling Babylon - I have found my home. Find a spot of shade - Have a delicious beverage - And enjoy the view! Welcome back, bikers! - Eat and drink and be merry - Furthermore, HAIKU! Sadness most supreme - Taco meat on the ground and - Not in my belly. Chalk is for us ALL - with dusty hands we share thoughts - All in Haiku form! Welcome back, bikers! - Our Adventures Ended...or - Have they JUST begun?? Half-way to Finish - hot, opeful and hydrated - Thanks to Bike JC! Pedal Together - throughout all Jersey City - Making our own Breeze! For ALL the photos from the day check out our Flickr Set!